My dad was visiting from abroad and stayed with us for a few days. On an evening we had to find something to do that suited both him and Me and Oh. So, a film night! Argo is a film hubby has waited for ages to watch. My dad and I had heard of it and it won lots oscars so it must be a good choice, right?! We got some nice drinks and a few nibbles and all settled down to watch. I am not sure what I was expecting, I knew it was a dramatic thriller with a serious story line, I knew it had the Awesome Ben Affleck both starring in it and directing it and I knew that loads of people had said how good it was, but I didn’t really know the story to come! Well, we were in for a real treat, it wasn’t a nicey nice film but it was a VERY good film. The story is serious, but this is a good thing, it keeps you really enthralled as you walk the story with them! It really is thrilling, in parts I was feeling the same emotions as the characters, fear, anxiety and then….well I can’t tell you the final one – it might give away the end! You can certainly see why this film won oscars, the acting is brilliant, the interpretation of the story is amazing, I now know what happened and I even felt how it was to be there! An amazing film, a definite must watch. You always want your children to like things that you liked. There are some characters that re-appear from Mummy and Daddy’s childhood in your children’s viewing, that you hope you will be able to enjoy together! 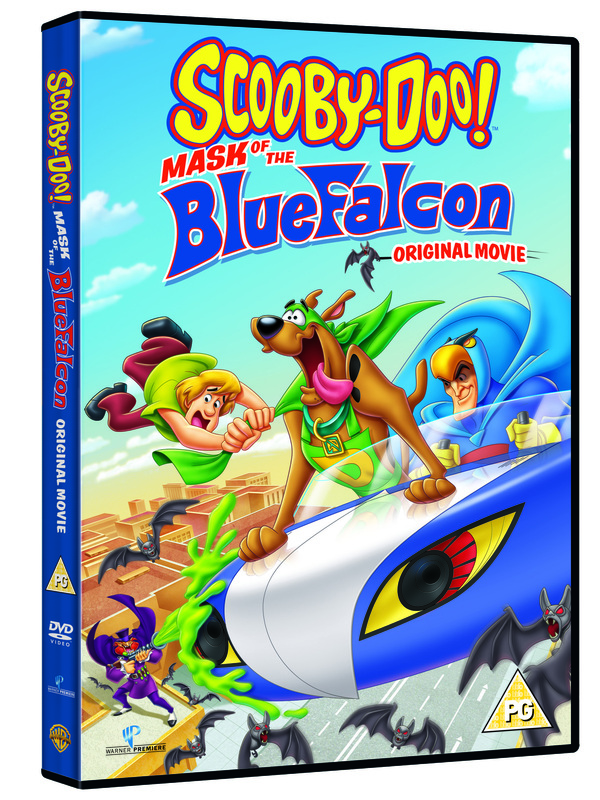 Warner Brothers brought out a new DVD on 18th February, Scooby Doo: Mask of the Blue Falcon! A classic character, so fingers crossed that we could all enjoy together! Both Monkey and Mouse were excited to ‘test out’ the new DVD, so we snuggled down with a drink and started to watch. Being the mum, I did worry slightly that having a baddie in it may be a little scary for them, but neither of them were worried and they happily didn’t move for the entire 72 minutes of fun! Glued to the TV they really got into the film, trying to guess the answer to the mystery and often saying ‘look mummy look’. 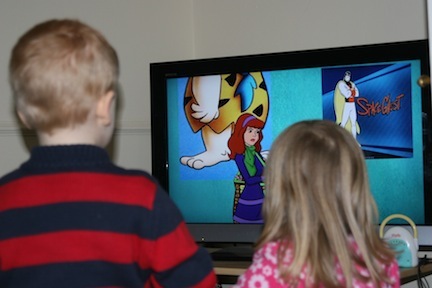 The only problem we had was that they were so drawn in, they kept getting closer and closer to the TV! We had a great family afternoon watching this and as soon as it was finished Monkey asked for it again, a sure sign that he enjoyed it! We really enjoyed it………….and it is all thanks to them pesky kids! Warner Brother’s have done it again with another fab family release! This is a great follow up to ‘Turtle’s Tale’, so you will recognise the characters and you will meet the second generation too! Sammy and Ray, leatherback turtles and friends forever, are enjoying an atoll’s water and sand, shepherding new hatchlings Ricky and Ella out to sea. Suddenly, actually I will let you watch the trailer and see for yourself! This is not a sponsored post, just thought you might be interested to hear about it – we can’t wait to see it as a family! So it is nearly Christmas and there is nothing better to lead up to the big day, than a nice night cosying up with the family to watch a film. So you can imagine how excited I was when this beautiful little lot arrived! So one for the whole family, one to watch with Daddy and one for a girls night! I really felt like Santa had arrived! Tom Hanks stars in and Robert Zemeckis directs this instant holiday classive filmed in dazzling performance-capture animation that makes every home magical. A roller-coaster up and down mountains, you can slip-slide over ice fields, tetter across mile-high bridges and be served hot chocolate by singing waiter more astonishing than any you can ever imagine. This Christmas Eve, grab a duvet, some treats, your kids and snuggle up for an enchanting journey. A lovely film to share with the family is the warm up to Christmas! I have never seen Daddy so excited at the arrival of a Blu Ray before! he was literally bouncing like a child at Christmas! It has been eight years since Batman vanished into the night……Assuming the blame for the death of D.A. Harvey Dent, the Dark Knight sacrificed everything for what he and Commissioner Gordon both hoped was the greater good. For a time the lie worked, as criminal activity in Gotham City was crushed under the weight of the anti-crime Dent Act. This is an absolutely awesome film and will be a sure win with any Batman fan! It had me gripped by my seat and Daddy was overly happy with it joining the Film collection! “New Year’s Eve” celebrates love, hope, forgiveness, second chances and fresh starts, with intertwining stories told amidst the pulse and promise of New York City on themost dazzling night of the year.What better way to enjoy a Girlie night over Christmas than a film filled with famous folk, love and fun! Best enjoyed with your friends, nibbles and a glass of wine, one of those feel good films that makes you smile! A fantastic selection for Christmas, so go, watch and enjoy! We certainly will be doing! Disclaimer: We were sent this package by Warners Brothers for the purpose of this post, however this has no bearing on the honesty of the post! The summer is officially over with the changing of the clocks this weekend. I am not that happy about it. Although there are plenty of things I love about this time of year, Bonfire Night, mushy peas and mint sauce, the run up to Christmas and lots of Duvet Days, I don’t like the dark mornings and dark evenings! However, what did cheer me up was this little lot turning up from the lovely people at Warner Brothers! Perfect I reckon for them Duvet Days I mentioned! I love nothing more than putting on comfy clothes, grabbing the Monkey and the Mouse, covering us up with the duvet and watching fab DVDs, sweets are an added bonus as is Daddy bringing me endless streams of coffee! So what was in the box? Four Fantastic DVDs, Stickers (which will probably soon be all over Mouses’ clothes) and some Bubbles! Tom and Jerry is a fab DVD to share with little ones, a classic programme from Mummy’s childhood that is still around now! 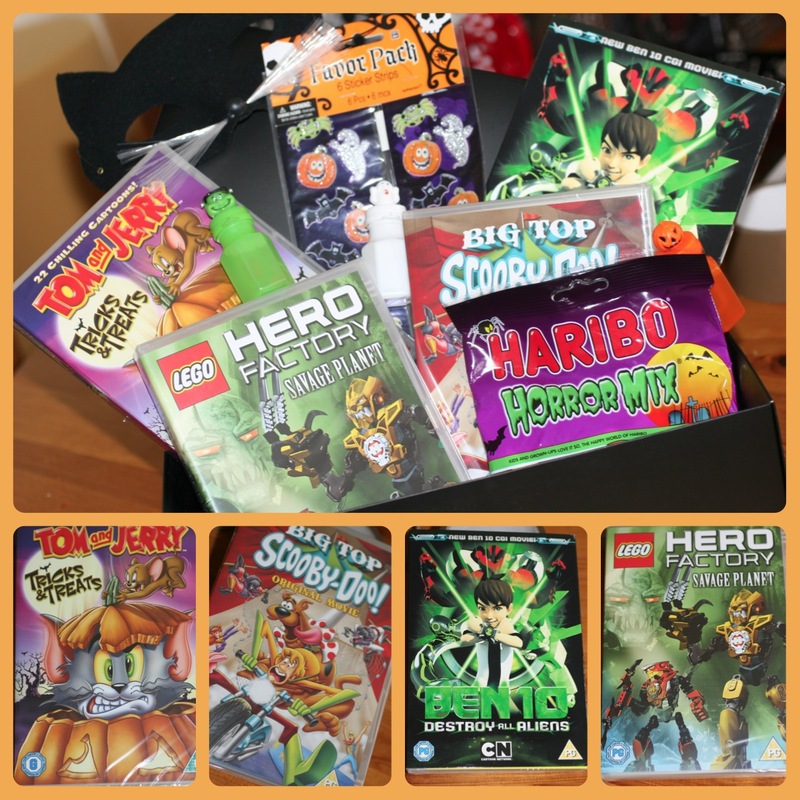 The Tricks and Treats DVD is perfect for this time of year with a spooky theme, but is nice easy watching for the younger children. The Big Top Scooby Doo (another classic) movie is fun packed with a mystery to solve. Lots of adventure to keep the children’s attention and a great way to spend an autumns evening with comfort food (yummy hot dogs). I think Monkey and Mouse are going to let the The Ben 10 go to our nephew – a major Ben 10 fan (well if they can prize it away from Daddy that is). The DVD follows 10 year old Ben on an adventure to Destroy all aliens! We are saving Lego Hero Factory for the weekend, we can’t wait to crack it open when Mouse has her nap. A special treat for Monkey to watch with Mummy and Daddy on a Saturday afternoon! He will be most excited, he loves lego and loves films – perfect combination! Please email me on writingsramblingsandreviews@hotmail.co.uk to claim your prize! 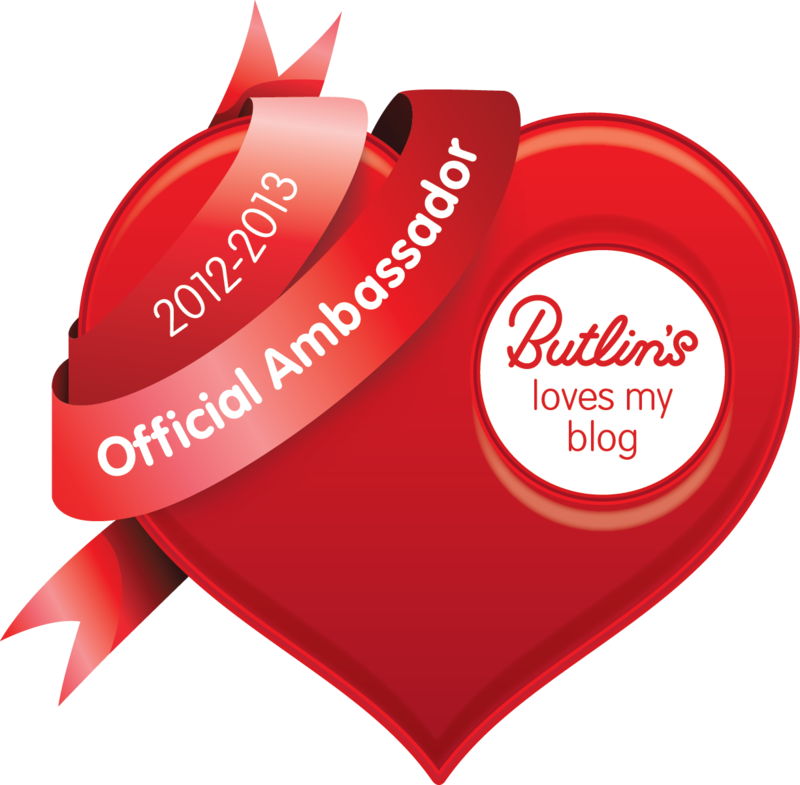 When I recently attended the Brit Mums Conference I got to chat to the lovely people from Warner Brothers! For a film loving family like us (nothing better than a duvet day watching family films) it was awesome to meet them and hear all about their services. One of the things I was really interested in hearing about was Ultraviolet. I don’t know about other parents, but I know for me it is really frustrating when you have crawled out from your duvet and gone on a long journey or to visit people and the kids are getting bored or stroppy tired and you know that their favourite DVD would calm the situation but it is not at hand! Well that is where Ultraviolet comes in, basically you buy a DVD or Bluray and within it is a code for a ultraviolet copy, you then go to a Flixster website (or app) and redeem your code. Then you can stream the film on your phone/tablet/computer/laptop where ever there is internet connection, and the bonus being you can download too for the times when there is no internet! How great does that sound? Awesome, I am certainly going to continue using the service, roll on the next visit to, well anywhere – we will have our whole movie collection with us! On top of hearing all about this, I was given some goodies to bring home, so being the lovely blogger I am I thought I would offer them to one of you! 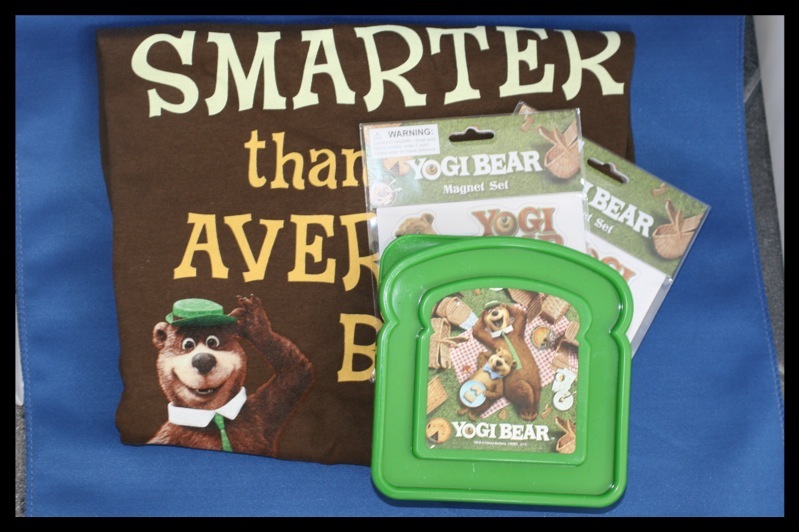 The prize is a yogi bear one and includes a medium ‘smarter than the average bear’ tshirt, two packs of magnets and a Yogi Sandwich Box! 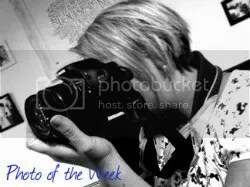 Terms: Competition Closes at midnight on Monday 30th July 2012. The compulsory entry must of taken place for any other entry to be valid. Writings, Ramblings and Reviews’ decision is final.